Divine Panacea A fabulous reward for Taoist. Right click to use it to turn Taoist`s Backsword into an Epic Weapon. 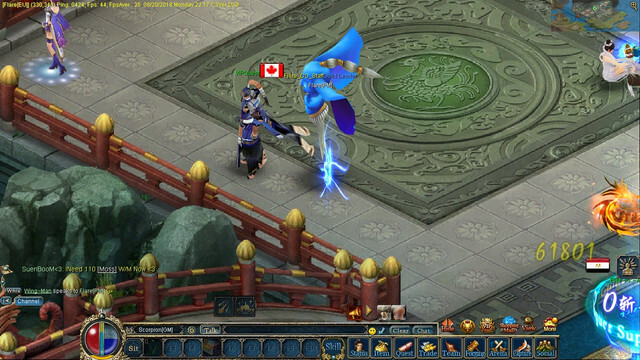 Aurora Lotus Scroll Water Taoist can use it to learn "Aurora Lotus", an exclusive skill of Taoist Epic Weapon, from Taoist Moon. Flame Lotus Scroll Fire Taoist can use it to learn "Flame Lotus", an exclusive skill of Taoist Epic Weapon, from Taoist Moon. Elite Bliss Hossu Taoists can equip it at the left hand as a secondary weapon. Blessing Touch Scroll Water Taoist can use it to learn "Blessing Touch", an exclusive and passive skill of Taoist Epic Weapon, from Taoist Moon. Breaking Touch Scroll Fire Taoist can use it to learn "Breaking Touch", an exclusive and passive skill of Taoist Epic Weapon, from Taoist Moon. Wish Lotus It`s said this lotus has the secret of Taoist`s Epic Weapon. Right click to check. Red Flower It can be used together with the White Flowers to activate the Refined Pure Oven for making a Treasure Leaf. White Flower It can be used together with the Red Flowers to activate the Refined Pure Oven for making a Treasure Leaf. 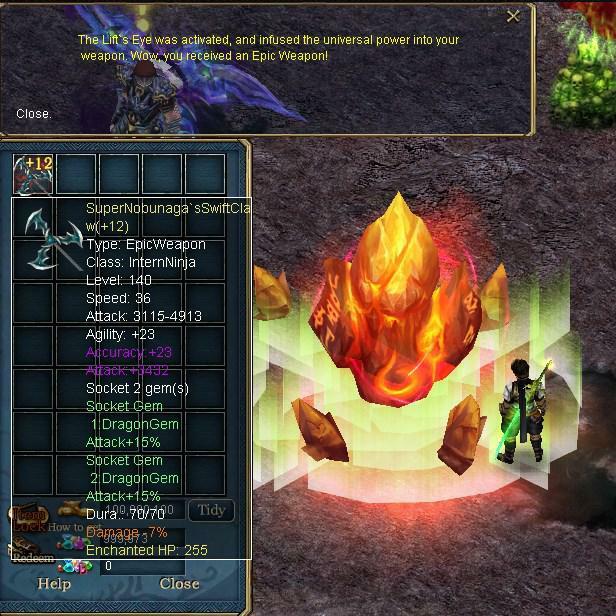 Treasure Leaf Put it into the Elite Pure Oven for making a Star Crystal. Star Crystal Put it into the Super Pure Oven for making a Divine Panacea. Yin Yang Fish A mysterious material of Taoist family. Swap it for a Taoist treasure with the Pure Taoist. 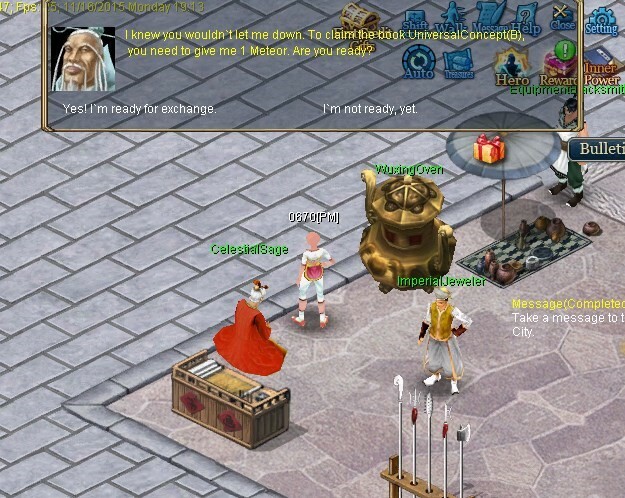 Talk to Taoist Moon (Job Center 56,33) to enter the Taoist Temple. Stage 1: Activate the Refined Pure Oven (Taoist Temple 80,80) with 3 Red Flowers and 3 White Flowers to make a Treasure Leaf. You can probably obtain such flowers in the Evil Abyss, where you can do the 2nd Rebirth Quest. Note: Only the first-time creditors and VIP 3 or above can spend 49 CPs to activate the Refined Pure Oven. The chance of making a Treasure Leaf is 10%. If failed, you can keep spending to run the Refined Pure Oven until you get as many Treasure Leaves as you want. 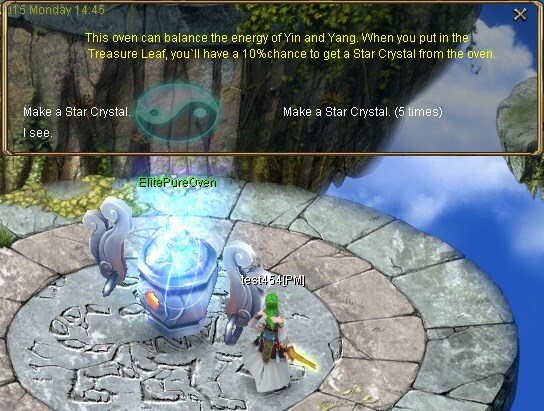 Stage 2: When you obtain a Treasure Leaf, put it into the Elite Pure Oven (Taoist Temple 64,64), and you'll have a 10% chance to obtain a Star Crystal. Note: If you failed to get a Star Crystal, you'll have to go back to the Refined Pure Oven to retry to make a Treasure Leaf. 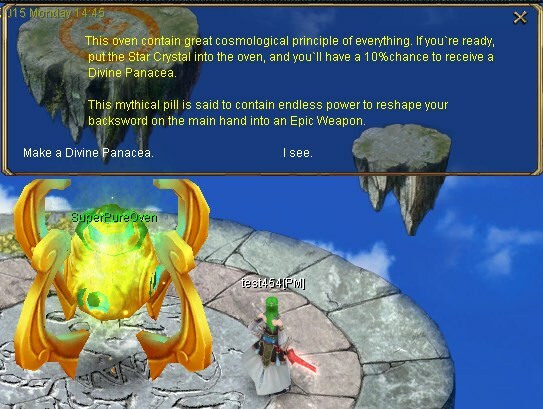 Stage 3: When you successfully get a Star Crystal from the Elite Pure Oven, use it to make the mystical Divine Panacea in the Super Pure Oven (Taoist Temple 48,48) at a 10% success rate. Note: If you failed to obtain a Divine Panacea, you'll have to return to the Elite Pure Oven, and retry to obtain a Star Crystal again. Once you obtained a Divine Panacea, use it to reshape your right-handed Backsword into an Epic Weapon of Taoist. If you failed to obtain the key items in the Elite Pure Oven and Super Pure Oven, instead you'll receive Yin Yang Fish. With Yin Yang Fish, you can exchange with the Pure Taoist (Taoist Temple 76,83) for fabulous rewards, such as an Elite Bliss Hossu, which can be equipped as a secondary weapon at the left hand. The eye-catching Hossu is exclusive for Taoists which perfectly reveals the purity and grace of Taoists. 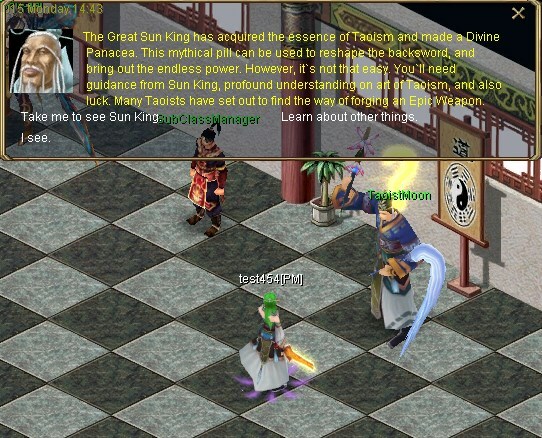 After obtaining Taoist's Epic Weapon, Taoists can give the skill scroll to Taoist Moon to learn exclusive skills. 1. What is Capture the Flag? 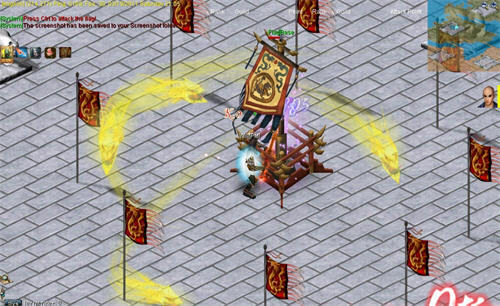 Capture the Flag is a new arena for your guild to establish your fame and honor. If you are interested in it, speak with the Guild Controller in Twin City (350,337) to learn more! All guild members can talk to the Guild Controller from 21:00 to 22:00 to enter the CTF Arena and fight with their guild to capture the Flag of Honor. There is no level limitation for participants. After you enter the CTF Arena, you will find 3 unoccupied flag bases in the Capture the Flag arena. Attack the flag base to capture it for your guild. 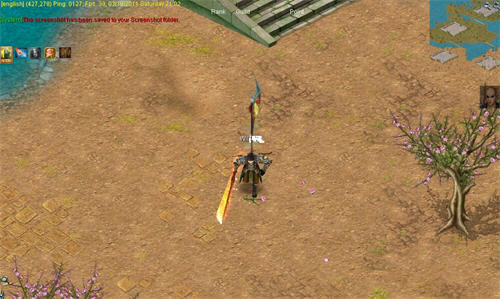 After your guild occupies a flag base, the location of the flag base will be marked with a yellow icon on the mini map. There are also some flags scattered around the arena. Seize a flag, then carry and plant it in the flag base your guild occupies within 60 seconds to gain points for your guild. You can jump, ride a horse, or use the acceleration skills in order to return to the flag base. 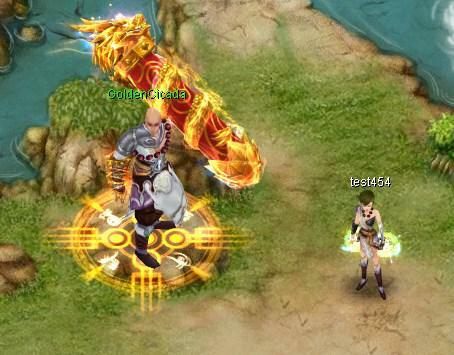 Remember to avoid the members of the opposing guilds and find protection from your guild members! Once you are attacked by members of an opposing guild, you will lose the flag you are carrying! Carry the Flag back to the flag base and the flag you seized will be planted in the base, earning you some points for your guild! The guild with the highest points at the end will win the CTF contest! The top 8 guilds will also be ranked. Flag carriers will be marked on the mini map, and the mark will move as the flag carrier moves. All players in the CTF Arena can see the location of the Flag Carrier, including your enemies. So, guild members should protect the flag carrier of your guild at all costs! If you are killed during the Capture the Flag Contest, you will be revived in a Safe Zone. PKing is not allowed in the Safe Zone. Meanwhile, you can buy some necessary items there. 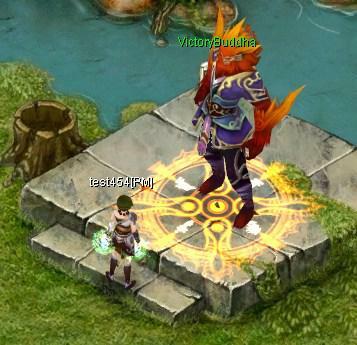 You can also find the Guild Keeper to return to Twin City, if you want to quit. During the Capture the Flag Contest, you will gain exploits by slaying enemy guild members, buffing your guild members, reviving guild members, and using Soul Shackle on enemy guild members' souls. Also, you will gain points for your guild by seizing the flag and slaying enemy flag carriers and taking the flag they are carrying. After you carry the flag back and plant it in the Flag Base, the flag is captured and your guild will receive 10 points. All your guild members who protect the flag and the flag carrier all the way back to the flag base will gain an additional 2 exploits. Before the Contest is started, the Guild Leaders can set the rewards for the Capture the Flag Contest. 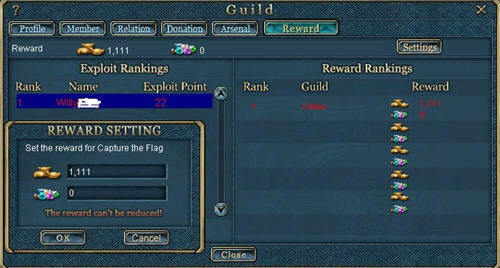 During the Capture the Flag Contest, Guild Leaders can also set or edit the reward for their guild members. After the Capture the Flag Contest, guild members can claim their rewards according to their contribution in the Capture the Flag Contest. If none of the Guild members have Exploits (only have Guild Points), the reward will be given to a random Guild member. When the event is over, prizes will be automatically sent to the top 8 guilds as guild fund. The guild leaders and deputy leaders of the top 8 guilds do not need to claim the prizes from NPCs. Here below are the rewards for the TOP 8 Guilds. 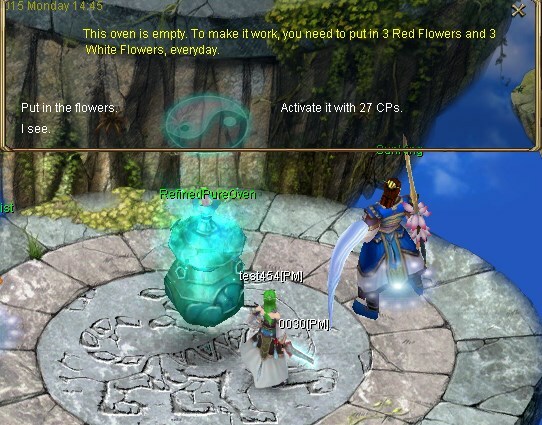 Use the Red Flower together with a White Flower, and you`ll receive 20 minutes of EXP. Right click to use. Use the White Flower together with a Red Flower, and you`ll receive 20 minutes of EXP. Right click to use. 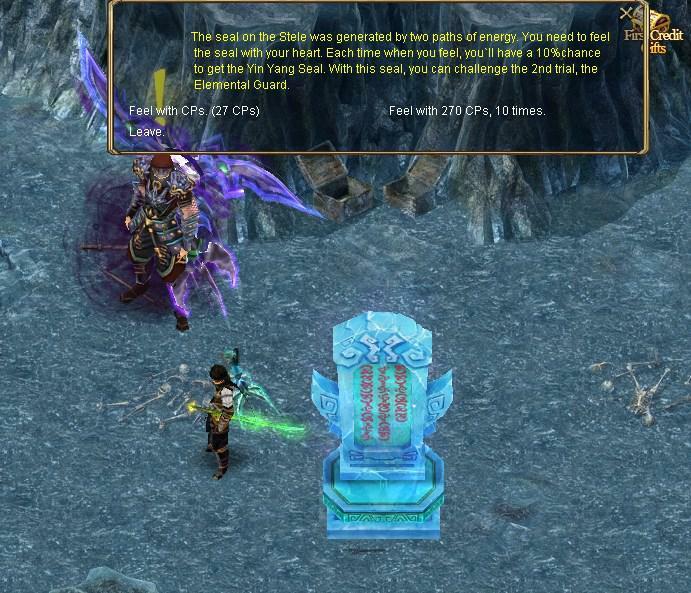 Use it to challenge the 2nd trial of Ninja`s Epic Quest: the Elemental Guard. 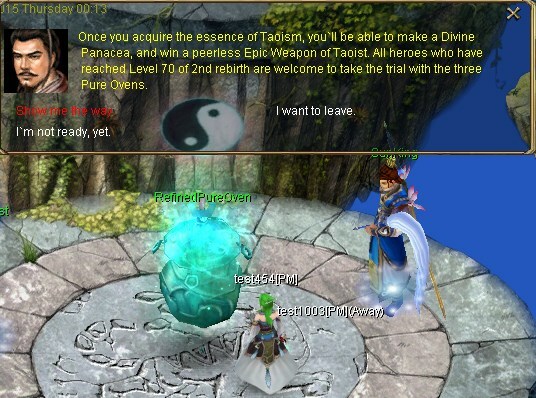 If succeed, you`ll win an Elemental Jade. Use it to continue the 3rd stage of Ninja's Epic Quest: The Wheel of Life. If succeed, you`ll win a Life's Eye. Right click to activate its power, and transform your katana into the mythical Ninja`s Epic Weapon. Born in a cosmic explosion, it can be used to exchange for various treasures with Swapper Starry at the Infinite Abyss. Give this scroll with the power of shadow to Wind Sage to learn a Ninja skill: Shadow Clone. Give this scroll with the power of devastation to Wind Sage to learn a Ninja skill: Twilight Dance. 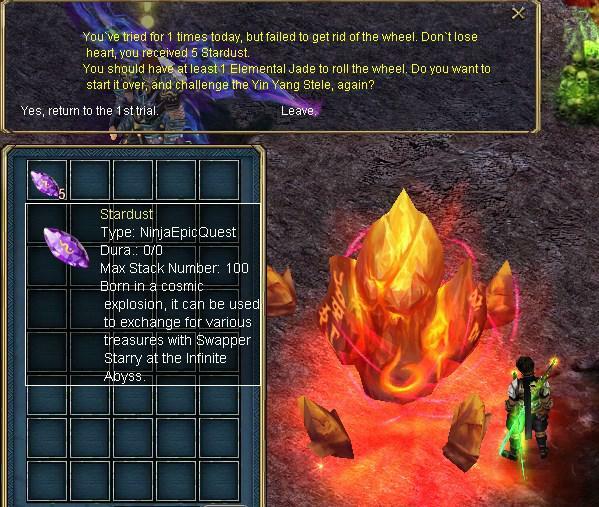 Give this scroll with the power of fracture to Wind Sage to learn a Ninja skill: Fatal Spin. You'll receive a Ninja Scroll in Inventory upon login. 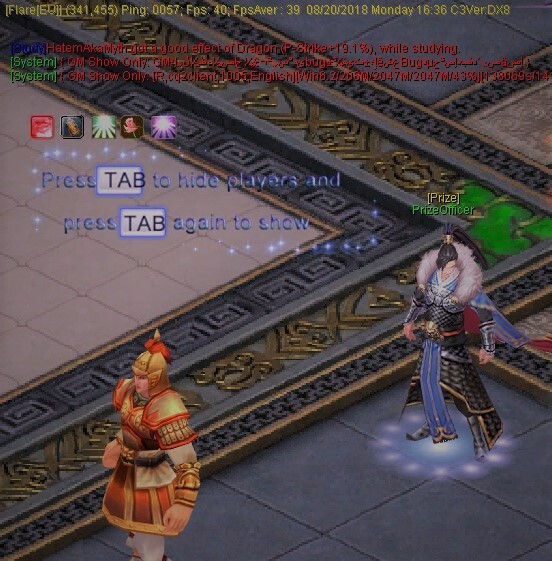 If you are a 2nd-Reborn Level 70 or higher Ninja, you can talk to Wind Sage at the Job Center (33,41) to enter the Infinite Abyss. When you arrive at the Infinite Abyss, you'll need 4 Red Flowers and 4 White Flowers to begin the quest. You can obtain Red Flowers and White Flowers in the Evil Abyss, where you can do 2nd-Rebirth quest. If you don't want to spend time on hunting for Red & White Flowers, you can also pay for the quest. Once you begin to balance the energy, there are 3 stages for you to complete the Epic Quest. Stage 1: Go to feel Yin Yang Stele, and you'll have 10% chance to obtain a Yin Yang Seal. 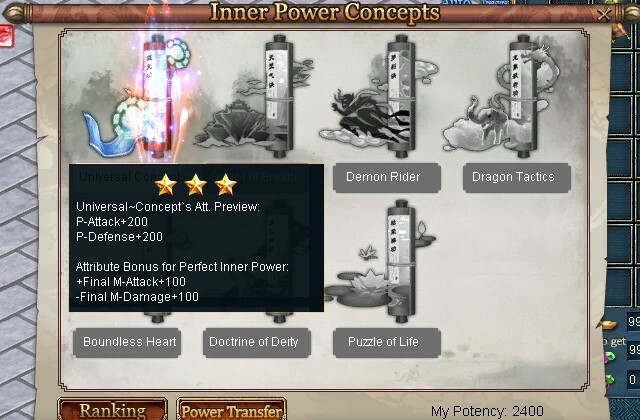 Note: Only VIP 3 or above can spend 270 CPs to feel Yin Yang Stele 10 times more than once, when you failed to obtain a Yin Yang Seal. You can keep spending to feel Yin Yang Stele until you receive as many Yin Yang Seals as you want. Stage 2: When you obtain a Yin Yang Seal, you can talk to the Yin Yang Stele to enter the 2nd area and talk to the Divine Shadow to take the 2nd Trial, Elemental Guard. Use a Yin Yang Seal to try to awaken the Elemental Guard, and you'll have 10% chance to obtain an Elemental Jade. Note: If you failed to obtain an Elemental Jade, you'll have to go back to the first trial and retry to feel the seal, and obtain a Yin Yang Seal to once again try to get an Elemental Jade. 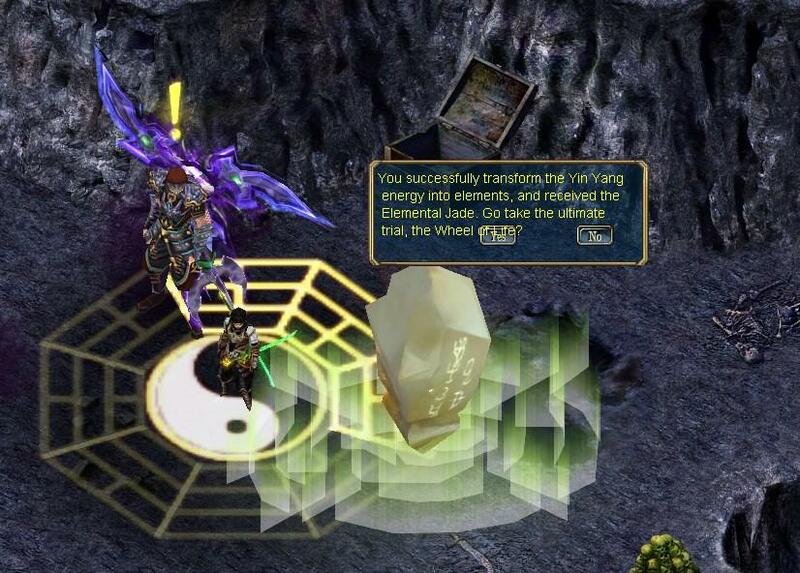 Stage 3: When you successfully obtain an Elemental Jade, use it to take the 3rd Trial, Wheel of Life, and roll the wheel. You'll have 10% chance to obtain a Life's Eye. Note: If you failed to obtain a Life's Eye, you'll have to return to the Yin Yang Stele area, and retry to obtain a Yin Yang Stele and an Elemental Jade again, to get to roll the wheel for a Life's Eye. Once you obtained a Life's Eye, you can use it to transform your Katana into a Ninja's Epic Weapon, Nobunaga's Claw. Note: When using a Life's Eye with a Katana equipped, you'll be able to transform the right hand Katana into an Epic Weapon, Nobunaga's Claw. If you already have a Nobunaga's Claw in your left hand, and a Katana in the right, when you use a Life's Eye, your Katana will automatically be transformed into a Nobunaga's Claw, vice versa. If you fail to obtain key quest items during Stage 2 and Stage 3, instead you'll receive Stardust. With Stardust, you can exchange with Swapper Starry at the Infinite Abyss (27,40) for Shadow Scroll, Twilight Scroll, Fatal Scroll, Chi Points, Protection Pills or Free Course. Note: The Nobunaga’s Claw can only be blessed when you reborn as Ninja – Ninja combination at the first rebirth. 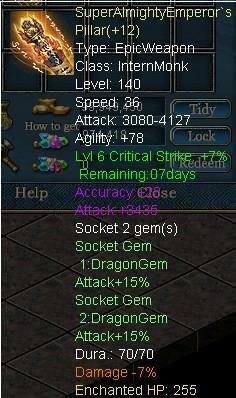 Or, you can also use 5 Tortoise Gems at Wuxing Oven in market (178, 204) to bless it. The mysterious Celestial Sage was secluded for a lot of years. Now he has returned with astounding Universal Concept! So many are eager to have their hands at the book that it creates great enthusiasm over the Universal Concept! 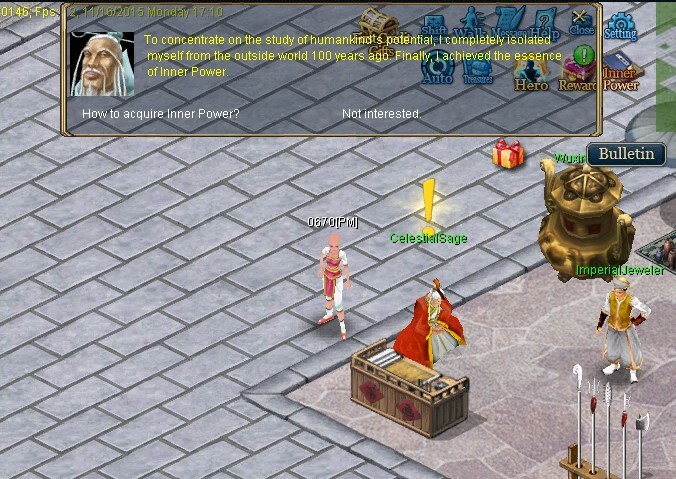 2nd Reborn heroes can find Celestial Sage (Market 178,209) to know about Universal Concept! It’s destiny that we meet each other. So Celestial Sage will give something precious as a gift, the first half of Universal Concept, Universal Concept (A)! Right click on the book to acquire. 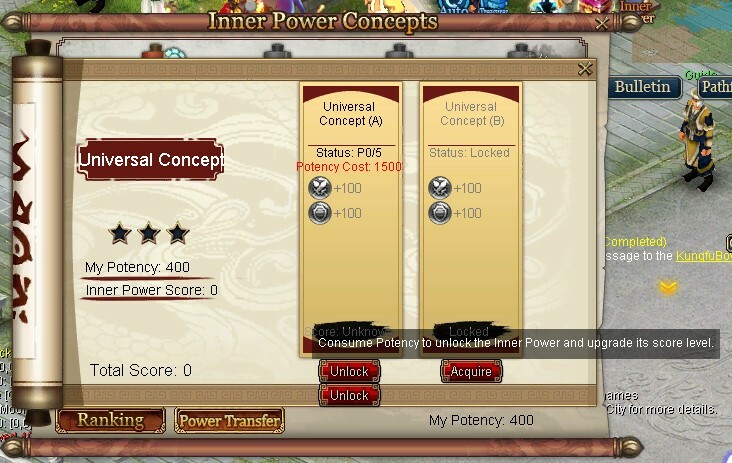 Then you could go on to click on the “Unlock” to improve Universal Concept (A) using Potency Points. When you reach the highest level, you could click on “Perfect” to complete studying! You are indeed talented! Now you can claim from Celestial Sage the next Inner Power book! 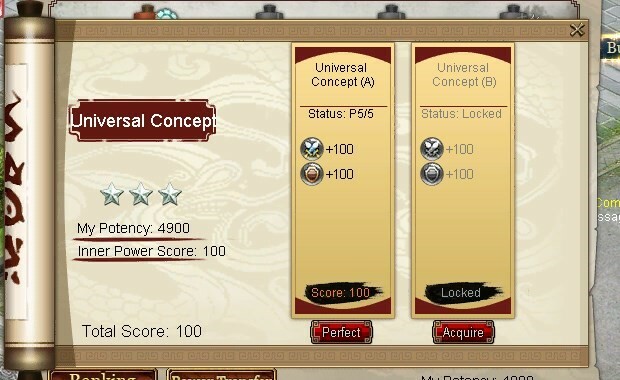 When you complete the whole Universal Concept and get attribute bonus! It’s said that a road of a thousand miles begins with one step. You need to stick to Inner Book and do not give up easily. It’s certain that you would be among the toughest! How to Donate with BITCOIN ? Boundless Heart With infinite power of Buddhism, it can be used to transform Monk’s Prayer Beads into a legendary Epic Weapon. 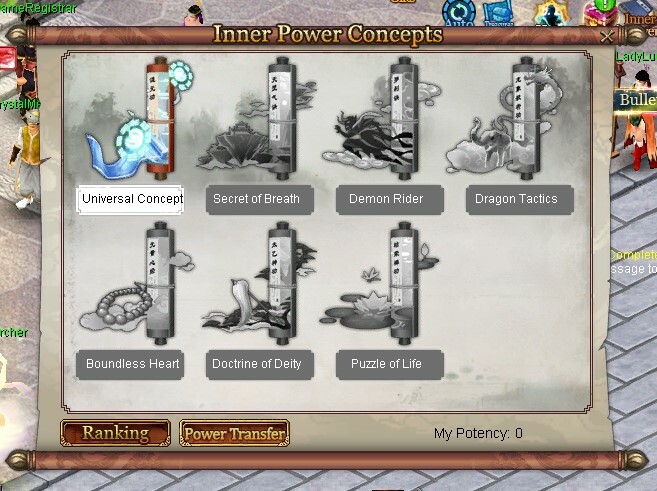 Wrath of the Emperor Scroll Monk can use it to learn Wrath of the Emperor, a passive skill exclusive for Monk’s Divine Pillar, from Head Abbot. 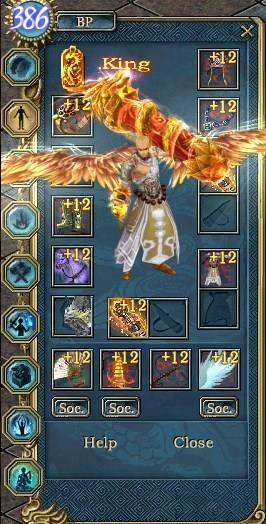 Grace of Heaven Scroll Monk can use it to learn Grace of Heaven, a passive skill exclusive for Monk’s Divine Pillar, form Head Abbot. Infernal Echo Scroll Monk can use it to learn Infernal Echo, a skill exclusive for Monk’s Divine Pillar, form Head Abbot. Buddhist Sutta This mysterious manual provides precious information about Monk’s Epic weapon. Use it to see Head Abbot, and get 30-min EXP. 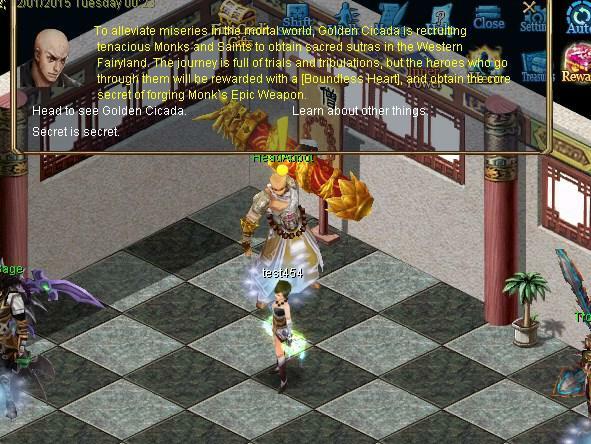 Rosewood Incense Exchange this increase with the White Dragon (Oriental Fairyland 54,63) for various treasures like Monk’s Skill Books. 1. Talk to Head Abbot (Job Center 36,33) to enter the Western Paradise. 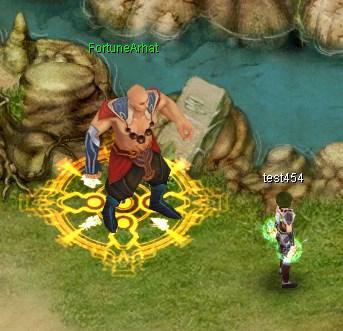 Stage 1: Submit 3 Red Flowers and 3 White Flowers to Fortune Arhat, and complete this trial to get a [Spiritual Gem]. Note: If you failed to obtain a Spiritual Gem, you'll have to submit 3 Red Flowers and 3 White Flowers to Fortune Arhat again. Stage 2: Submit [Spiritual Gem] to the Altar Cleanser, and remove distracting thoughts to get [Buddha’s Necklace]. Note: If you failed to obtain a Buddha’s Necklace, you'll have to return to Fortune Arhat, and retry to obtain a Spiritual Gem again. Stage 3: Submit [Buddha’s Necklace] to the Victory Buddha, and complete this trial to get a [Boundless Heart]. Note: If you failed to obtain a Boundless Heart, you'll have to return to Altar Cleanser, and retry to obtain a Buddha’s Necklace again. 3. Once you obtain a Boundless Heart, use it to reshape your right-handed Bond into an Epic Weapon of Monk. 4. If you want to reshape your left-handed Bond into Epic Weapon, you need to repeat the process form step 1 to step 3 again. 5. 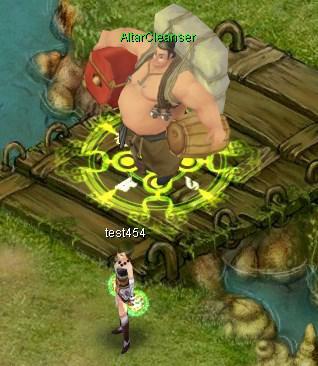 If you fail to obtain the key items in the Altar Cleanser and Victory Buddha, instead you'll receive Rosewood Incense. 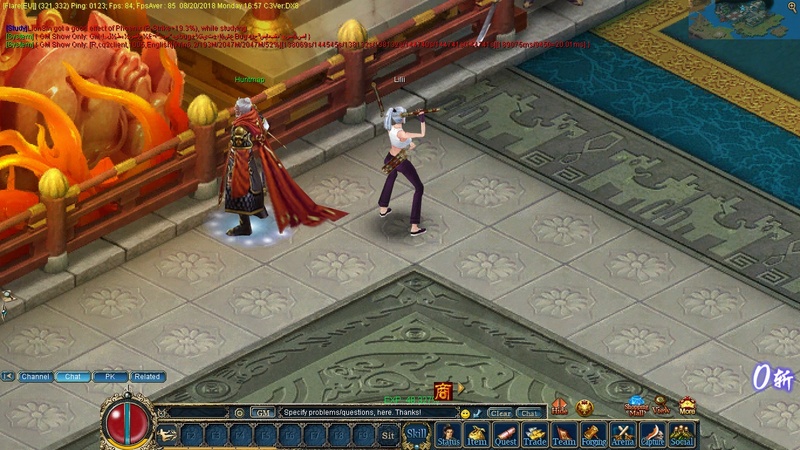 Rosewood Incense, you can exchange with the White Dragon (Oriental Fairyland 54,63) for fabulous rewards, such as an skill scroll, Chi Point, Free Courses and Protection Pill. 6. 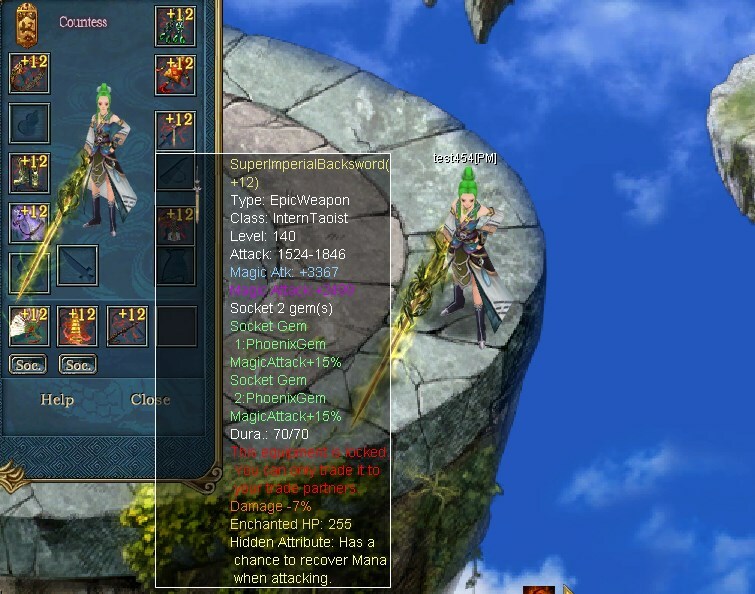 After obtaining Monk's Epic Weapon, Monks can use the skill scroll to learn exclusive skills. 1. Head to VIP Quest NPC at Twin City. 3. Now it's time for hunting down some monsters ! 5. After getting 5xImpureVigor you can now get your reward from Arthur. 1. PK is availabe in the quest region and all pk rules are applied ( pk points , Blue names ,...etc). 2. Items can be dropped if killed. How much cps does monster drops ?